Cisco takes a ‘sensible’ single-brand approach to its collaboration portfolio. It's been about two and a half years since Cisco launched its Spark app and cloud back end. Since then the company has rolled out lots of other products in the Spark portfolio including phones, digital whiteboards, and meeting room systems. Despite the broad portfolio and strong marketing push, for many customers the difference between Webex and Spark has been confusing, which has likely hurt sales of both. Also, the constant drumbeat of Spark announcements created the perception that Webex might be going away despite Cisco continually adding new features to the product. Webex is geared toward making meetings more effective, while Spark facilitates better team interactions... but teams do meet, and Webex allows for messages to be sent back and forth, so there is clearly some overlap between the two. To help make things simpler, Cisco took a bold step today by changing the branding of the products. At Cisco Collaboration Summit, taking place this week in Phoenix, Ariz., the company announced it was rebranding Spark to Webex Teams. However, the shift from Spark to Webex Teams isn't limited to the name only. The technology powering the two products has been integrated into a common cloud back end, giving both products the same look and feel regardless of which one is used. Users can work most of their day in Webex Teams and then join a Webex meeting directly from the app, so moving between Webex Teams and Meetings should become almost seamless to the user. Webex also got a facelift this week, details of which can be found in this No Jitter post. Some might look at this and scratch their heads and wonder why Cisco did this after pouring so much into the Spark brand. I believe this shift makes sense for Cisco because of the coming together of the platforms and creation of a single experience. If customers were confused before, the confusion level could take a step function up with a common look and feel as now customers may not really know what application they are in. If brand consolidation is the right move, that raises the question, why not keep Spark and ditch Webex? To me, this is a no brainer. We industry folks are obviously very aware of Spark... but we eat, live, and breathe this stuff every day. Most enterprise line of business managers or other decision makers for collaboration tools do not have the same level of exposure to all of these new collaboration tools, so they may not have heard of Spark. 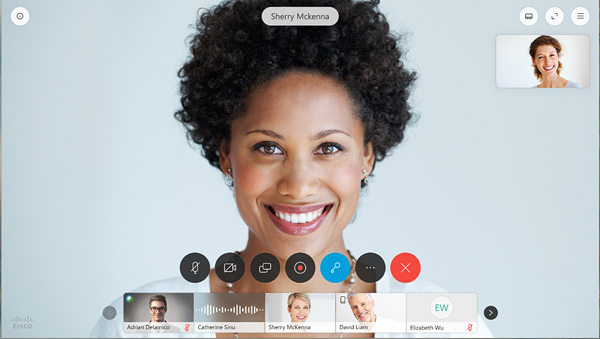 Webex, on the other hand, is one of, if not the most widely known and trusted brands in meetings. Despite some recent pressure from smaller vendors, Webex does 6 billion meeting minutes per month and is the dominate market share leader with 41%, more than two times the No. 2 vendor, GoToMeeting (which has 18% share according to Synergy Research Group). The Webex brand goes well beyond IT departments as much of the purchasing of the product is done by lines of business or knowledge workers. Shelving the Webex brand would mean losing much of this mindshare and brand equity and would be a mistake as it would take Cisco a long time to get Spark to where Webex is currently. The change in branding and platform consolidation should help Cisco in selling the product as well, as the lead now becomes Webex Teams. Businesses can build collaborative workflows around Webex Teams and then launch Meetings or Calling when needed. This should help Webex Teams gain better traction but keep the Meeting product embedded into companies that currently use it. Also, the common look and feel should make it easier for workers to use the suite of products as the transition from one app to the other would be seamless. I'm sure the rebranding decision wasn't an easy one but it does fall in line with one of the directives set forth by CEO Chuck Robbins when he assumed the helm of the company -- that is, to make Cisco products easier to buy and easier to use. The multiple brands and overlapping features was confusing and was the antithesis of that statement. Webex as a single brand is much more sensible.